Here’s an elegant surprise for someone very special—our sparkling ballpoint pen filled with dazzling Swarovski® crystals! Crafted by the masters at Swarovski®, this unique keepsake arrives in a stylish blue velvet pouch for a sleek presentation. 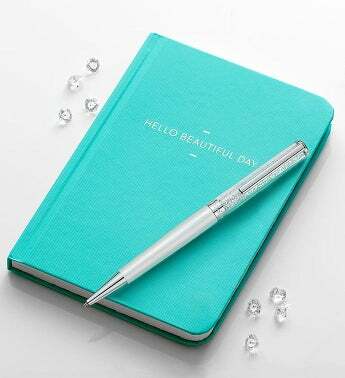 What better pairing than to add our chic and cheerful journal, featuring a warm and pleasant sentiment “Hello Beautiful Day.” It’s the perfect inspirational gift set for the writer in your life to keep all their notes, sketches and new ideas! Swarovski® is a leading producer of Austrian crystal fashion jewelry, accessories and home décor. Their designs are well recognized for impeccable sparkle and beloved by all with a storied heritage in the fashion and entertainment industry.